May I try something?” I asked my 6 year-old son, gesturing for his soccer ball. He said, “Sure!” and kicked it over to me. I then lined myself up and swung my leg through it, connecting cleanly and knocking the ball into the far upper V of the goal about 25 yards away. My son’s eyes got wide as he was clearly impressed. To him, I had just done the unthinkable. Not only would he not be able to kick the ball that far, but he wouldn’t be able to get the ball off of the ground, much less direct it properly. Therefore, to him, what I had just done was magic. To him, it was incredible. But that’s because he is still small, still growing and still inexperienced. He hasn’t seen the hours of practice that went into my being able to kick a soccer ball that well. Even more so, he didn’t realize that what he saw was pretty much just a fluke. He didn’t see the amazement on my own face at the placement I had just achieved. All he saw was the nonchalance I faked. As if I could do that again and again with equal precision. Upon reflection, I realize that that’s what I did: I covered up my poor abilities with one success – albeit a beautiful one (I think great shot placement is beautiful). 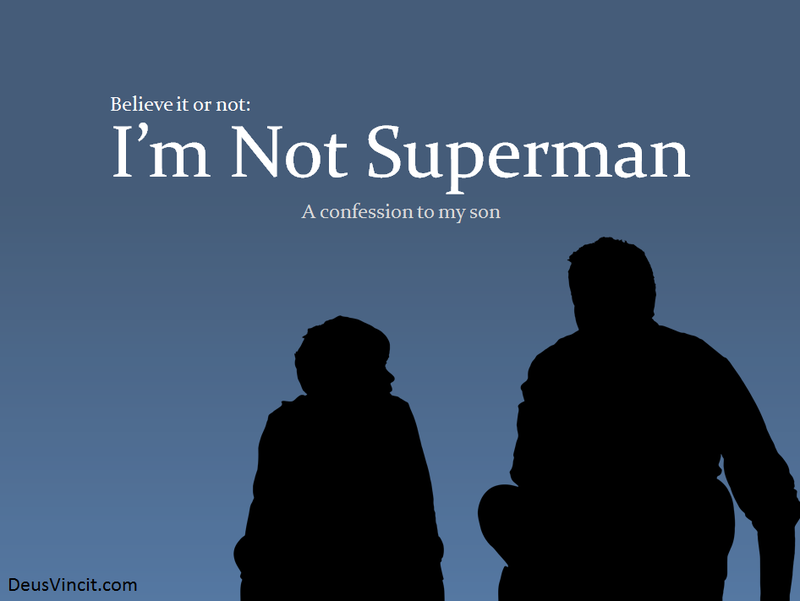 I wanted my son to see me as superhuman for a moment. I wanted him to see me the way I always saw my dad (still do, incidentally): able to do what is supernatural. Able to pull the proverbial rabbit out of the hat through some feat of strength or ability or ingenuity, if not magic. It’s not that I want to deceive my son; it’s that I want to inspire him. I want him to work hard to learn new skills. I want him to dream big dreams. I want him to maintain a belief, for as long as possible, in what might be. I want him to be … well … to be honest, I want him to be better than me. One of my biggest fears in life is that day when the scales fall from the eyes of my son and he’s no longer blind to the fact that his dad is just a simple man; a man not especially skilled or strong or smart or powerful. Just … a man. In spite of me wanting him to dream for as long as possible, I don’t seek to put off that day. After all, I know that it is coming. Nor do I seek to somehow become something that I’m not in order to keep the charade going for just that little bit longer. After all, the longer you fake something the more devastating the results of its inevitable revelation. No, I will allow time and growth and wisdom to reveal to my son that I am not the titan which he seems to think now. But there is one thing I will do. There is one thing which I will demand of myself: that I keep striving to get better. Not for the purpose of raising the bar to some unachievable level for my son to follow after me (certainly not!). Instead, for the purpose of showing that, when the supernatural dreams of a young boy fade or fall as that boy becomes acquainted with manhood, a real man fights and works and continues on … with hope in his heart. You see, I am what I am … and that’s all I am (if I may quote Popeye). I’ve got nothing special about me. I possess a few modest skills here and there – many of which are found in much more abundance in other middle-class American men. I possess a modicum of ability to grow, learn or figure out answers to the riddles of life. I can kick a soccer ball moderately well. I’m reasonably good at my job. I can write semi-well. And I can give speeches and sermons fairly well. All of these skills are liable to tarnish over time. When I’m 65 years old, I doubt I’ll be able to shoot a soccer ball as well. When I’m 70 my ability in my job might begin going south. When I’m 75 my ability to speak may be lost as my mind wanders and my voice fades. When I’m 80 I may not even be able to write. However, I have one thing which is beyond price and which therefore I simply must develop and pass on to my son: the knowledge that God loves me and wants me to use the talents and skills He has given me – in whatever season of life – to glorify Him. That’s the calling of a man … of men … of mankind: to give our all to glorify God. To be certain, it’s a calling that seems completely lost on much of the world. Instead of glory for God – something attainable by the lowliest man in society – we see glory as only something to be attained for ourselves. Thus, the young boy dreams of throwing four touchdown passes in a Super Bowl MVP performance or of rising to the rank of President to the cheers and admiration of all Americans (or a voting majority of Americans at least). Even the purest motivations, the purest men and boys, seem too often controlled by a lie that we believe without knowing its source. We may never hear the lie outright; never see it written in a book or intimated by some “wise” creature. It is almost birthed from something within us. Perhaps the flesh that wars against our souls manufactures the lie and whispers it a thousand score times until it is believed as truth without scrutiny? The lie is this: that no glory can exist outside of our glory. For this reason we live and die on our successes and failures, thinking our value rises and falls with our fortunes. We place on our shoulders, alive and sweaty with toil, not just the burden of doing a job well, but also the consequence of the work. I might ask us though: after the field is plowed and the seed is planted, do we have control over the rain that falls? Must we also hold ourselves accountable for the things outside of our power? If the answer to these questions is a negative, then our efforts, whether met with success or failure, are valuable only for the exertions we pour into them. After all, did not the praise given to the faithful servants in the Lord’s parable of the talents (Mt 25 and Lk 19) revolve around the fact that they had poured what strengths were alive in them into their work? The specific work itself seemed immaterial for the thrust of the story; we weren’t told that the five talent guy invested in oil speculation or that the two talent dude plunged his money into furniture manufacturing. The fact that the two servants worked is the focus. The one who did not work was called “wicked” and “lazy” (Mt 25:26), the ones who worked were called “good” and “faithful” (Mt 25:21,23). But it would be a misappropriation of a finite servant’s abilities to attribute the growth to him. Though the five bags servant and the two bags servant got to present their proceeds to their Master, they didn’t have the audacity to claim that whatever gain they achieved, it came fully of their own merits. No, I’m not trying to make some stupid statement like, “If you’ve got a business, you didn’t build that!” As if the attribution of gain could be more adequately applied to the government or the proverbial village. Instead I’m saying that the farmer’s sweat and blood falling on his tilled earth is his claim on the eventual produce, but he must still rely on God to not only deliver the rain in time and in perfect measure, but to also uphold the potential of the seed which was planted. We may be able to study and understand the science which governs the remarkable potential of growth and production in a seed, but we will never be able to attribute the why behind that seed’s potential to anything done by man or inherent in the infinite chance of undirected nature. In other words, a man might pour his heart and soul and mind and strength into the work he has, but without God giving the increase, the man’s work is vain. The gain of the five talent man should be fully attributed to God, the gain of the two talent man should be fully attributed to God and the gain of the farmer on the day of harvest should be fully attributed to God. He lends to His servants a portion of His treasure that we might gain more for Him, to His glory … and then He transforms our meager work into something extraordinary and meaningful. What, after all, is Apollos? And what is Paul? Only servants, through whom you came to believe – as the Lord has assigned to each his task. I planted the seed, Apollos watered it, but God has been making it grow. So neither the one who plants nor the one who waters is anything, but only God, who makes things grow. The one who plants and the one who waters have one purpose, and they will each be rewarded according to their own labor. For we are co-workers in God’s service; you are God’s field, God’s building. By the grace God has given me, I laid a foundation as a wise builder, and someone else is building on it. But each one should build with care. For no one can lay any foundation other than the one already laid, which is Jesus Christ. If anyone builds on this foundation using gold, silver, costly stones, wood, hay or straw, their work will be shown for what it is, because the Day will bring it to light. It will be revealed with fire, and the fire will test the quality of each person’s work. If what has been built survives, the builder will receive a reward. If it is burned up, the builder will suffer loss but yet will be saved – even though only as one escaping through the flames. We can paraphrase Paul’s words for everything which we do. I may be the lone worker or a part of a large team of workers. I might do all of the work or a portion of the work. I may sweat buckets or thimbles. But without God giving the increase, it is nothing; all is vanity. Now, don’t get me wrong – I mean this with every fiber of my being – a REAL man works! A real man gets up every day and strives to be better. A real man attempts to hone his skill and grow his crop. A real man puts his shoulder to the plow and plows his field. A real man gets up early and sows his seed. A real man joyfully gathers in the crop. But, a real man also realizes that he is an empty shell, incapable of forcing any of the growth and beauty that results beyond those acts … because GOD GIVES THE INCREASE. So, when my 6 year-old son sees what I do, I want him to see me sweat and work and toil because it’s right and good and proper. I want him to see me trying to get better at my work every day because that is also right and good and proper. But, more than anything, I want him to see me stop and glorify God when the produce is reaped. I want him to see me with an unwavering heart of gratitude and humility before the God of the increase. In the end, I do want the scales to fall out of his eyes so that he can recognize me as just a simple man … and God as the omnipotent and benevolent provider that He is; because that is what will make my son a better man than me.